I’ve been haunted by Clara Lindberg’s Ghost Swirl since the first time I read her post—and especially since my own failed attempt. I’ve also been obsessed with Spin Swirls, so I thought I’d combine the two and see what happened. I think my first attempt at the Ghost Swirl failed because I used frozen beer as my lye water and couldn’t let the soap gel. This time no beer, no scent. Just a naked batch at very cool temps to keep everything liquid. I split the batch into two equal parts before adding the lye solution—one with a water reduction. In hindsight, I should’ve done three parts and had more interest, but I wanted to keep things simple. I then poured soap from one batch in three different spot of my slab mold for a count of two, then poured three more spots from the second batch and poured a second layer with second batch on the first set of spots. Like a faux funnel. I did this for a few rounds and gave my mold a little spin clockwise, stopped abruptly, another longer spin clockwise, stop, counter clockwise stop and so on. It was hard to see the difference in the two batches at that point. The magical color change hadn’t happened, but I popped it the oven (pre-heated to 170, then turned off) and when I peeked an hour later, sure enough—the ghost was emerging. It has a sort of punk rock elegance to it—perhaps I conjured the ghost of Joey Ramone. 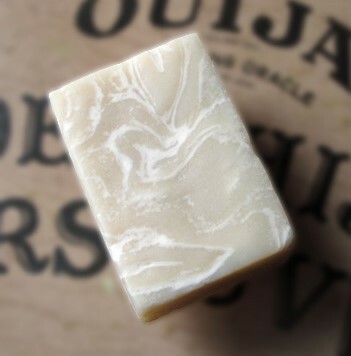 Does that at least make me a Soap Witch in Training?